The Trump Transition Team released a statement Saturday night on President-elect Donald Trump and Vice President-elect Mike Pence day of meetings at the Trump National Golf Club in Bedminster, New Jersey. 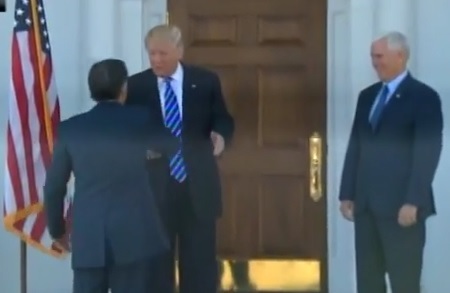 (New York, NY) – President-elect Donald J. Trump and Vice President-elect Mike Pence today held meetings at the Trump National Golf Club in Bedminster, New Jersey. 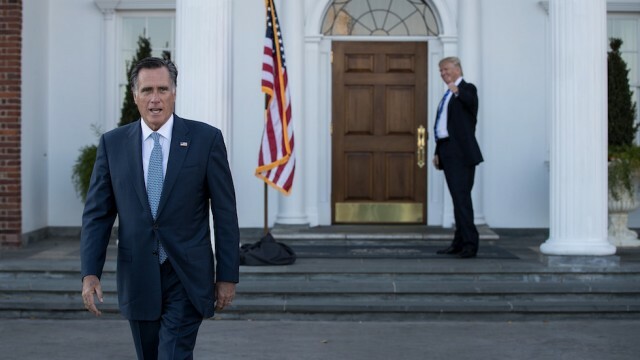 Their first meeting of the day was with Governor Mitt Romney. They had a substantive and in-depth conversation about world affairs, national security and the future of America. It was an extremely positive and productive conversation. The President-elect and Vice President-elect then met with Ms. Michelle Rhee and enjoyed an in-depth discussion about the future of public education in our country. This included the possibility for increasing competition through charter and choice schools. They also brought the idea of merit pay for teachers going above and beyond in their classrooms into the conversation. Their discussion with Ms. Betsy DeVos was focused on the Common Core mission, and setting higher national standards and promoting the growth of school choice across the nation. The President-elect and Vice President-elect were very impressed in their meeting with the “real deal” and American hero General James Mattis. They had an incredibly in-depth conversation on plans for national security. The discussion included ISIS, the Middle East, North Korea, China, NATO and other hotspots around the world. A constructive conversation occurred with Mr. Todd Ricketts. It involved domestic commerce, ingenuity and growth for our country. Discussions on tax reform regulations and entrepreneurial initiatives were also included. The President-elect and Vice President-elect had a great discussion with Mr. Bob Woodson regarding community-based developments and opportunity. They also discussed plans to strengthen neighborhoods across America and faith-based initiatives. Their conversation with Mr. Andy Puzder was regarding regulations, labor reforms, and freeing up small business loans for new and innovative business ventures. Discussion on international trade was also included. In the meeting with Chairman Lew Eisenberg, President-elect Trump and Vice President-elect Pence discussed plans for America First initiatives, bringing Made in America manufacturing to the forefront and improving infrastructure. Dr. Patrick Soon-Shiong joined President-elect Trump and Vice President-elect Pence for dinner this evening. The renowned doctor has appeared on the cover of Forbes for his advances in finding a cure for cancer. They discussed innovation in the area of medicine and national medical priorities that need to be addressed in our country.